Q1. What is the code for ‘village’ ? Q2. What is the code for‘militant’ ? 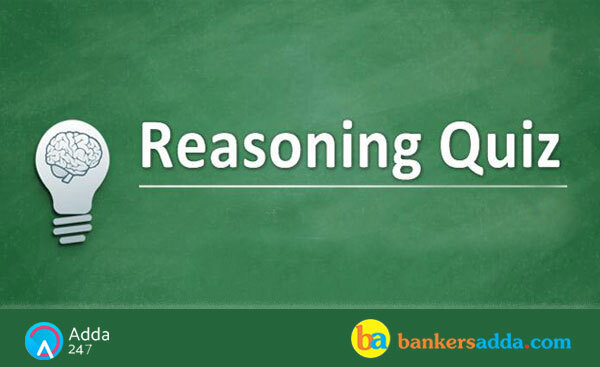 Q3.What is the code for ‘count’ ? Q4.What is the code for ‘camp’ ? Q5.What is the code for ‘spotted’ ? Seven persons B, M, K, P, D, F and H go to disco on four days – Tuesday, Wednesday, Friday and Saturday – in a week. At least one person but not more than two persons go to the disco on each of these days. Each of them likes different singers – Sheeran, Eminem, Bruno, Demi, Elvis, Kristen and Kanye. P goes to disco on Friday with the one who likes Kristen. The person who likes Bruno does not go to disco on Saturday and he does not go to disco with D and H. F likes Kanye and he goes to disco alone on Tuesday. M goes to disco on Wednesday and he does not like Bruno. K goes to disco on Wednesday. H does not like Kristen. The one who likes Bruno goes to disco with the person who likes Sheeran. The person who likes Demi goes to disco on Friday. B likes neither Eminem nor Kristen. Q6. B likes which singers? Q7. On which day of the week does D go? Q8. Who among them goes to the disco along with B? Q9. On which of the following day the persons go to disco who like Eminem and Elvis singer? Q10. What is P’s choice of singer? Directions (11-15): In each question below are given three statements followed by three conclusions numbered I, II and III. You have to take the given statements to be true even if they seem to be at variance with commonly known facts. Read all the conclusions and then decide which of the given conclusions logically follows from the given statements, disregarding commonly known facts. Q11. Statements: Some steel is blood. All blood is red. No steel is water. I. Some water is not red. II. Some water is not blood. Q12. Statements: All cup is wire. No wire is tea. Some tea is pin. I. No cup is pin. II. No wire is pin. III. Some tea being cup is possibility. Q13. Statements: Some foot is leg. All leg is man. No man is girl. I. Some girl is not foot. II. Some girl is not leg. III. All girl being foot is a possibility. Q14. Statements: All flag is green. No flag is red. All white is red. I. Some green is not white. II. No red is green. III. Some white being flag is a possibility. Q15. Statements: All line is bulb. Some line is salt. No salt is sugar. I. Some bulb is not sugar. II. Some line is not sugar. III. All sugar being bulb is a possibility.